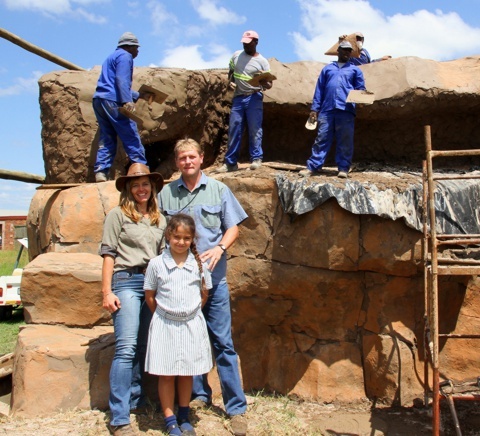 Grade 3 learner, Lea Conti, visited the Sanctuary with her Saint Marys classmates in the first week of March- just in time to meet Ruan Schönefeld of the Wild Exposure Rock team and see exactly how the Bearded Vulture cliff was being built. Lea has been part of the Bearded Vulture Project from the beginning and has help raise funds for Leseli’s new home. In the past months the African Raptor Trust has been fundraising to provide our non-releaseable Bearded Vulture a decent long-term home. Named Leseli (bird of light) in a Lesotho school competition is the only bird of her kind in captivity. So for our one-and-only bearded lady we needed the best and so we approached Mike Behr of WILD EXPOSURE for help. WILD EXPOSURE is the industry leader in Southern Africa in the design and construction of artificial rockwork. Mike and his team came and conquered leaving us with the most beautiful cliff complete with erosion potholes for Leseli to nest in. Local metal merchants Sharp Metal Pressings and Hendok provided the materials to work with and the Wild Exposure team wholeheartedly committed to providing the best rock-work a bearded vulture could hope for. We will keep you posted as we complete the enclosure. Mike Behr (left) donated Wild Exposure’s time and skills (to the value of over R 200 000) to the Bearded Vulture conservation project by building a cliff-face roost and nest site specific to Leseli’s individual needs.